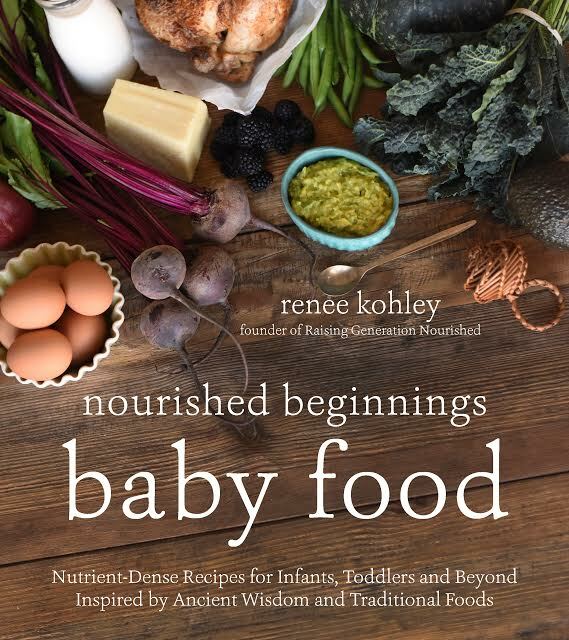 Natural Remedies Products & Books We Love! Kids Not Sleeping? Environmental Sensitivities & Toxins Could Be The Culprit! 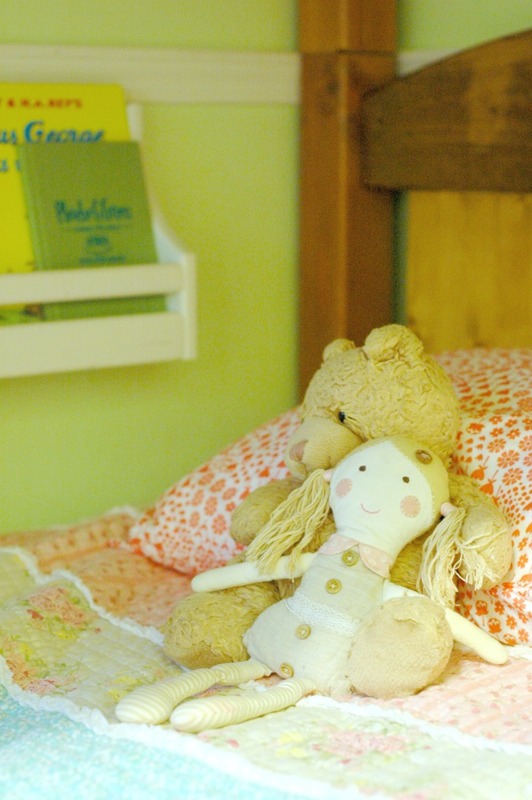 Kids spend close to half of their 24 hours in a day in their beds! Are your kids sleeping in a toxin free zone? Product links in this post are affiliate links. It does not cost you anything and helps maintain the free information on this site. I was provided product from NaturePedic in this post for review purposes and did not receive monetary compensation. The ever constant desire of almost any parent, and yet it is something that isn’t talked about near often enough. 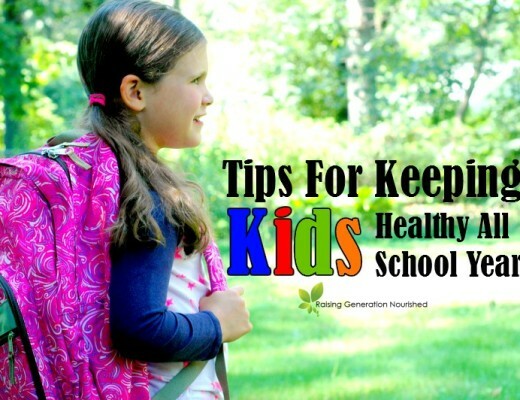 We talk a lot on this blog about how to nourish kids with the right food so that they can function well all day, and sleep well at night, but the physical environment our kids are sleeping in is just as important as food to their overall health – both day and night. This was me about 4 years ago when I put my oldest into a big girl bed for the very first time. We struggled for almost a year with restless nights, darkness around her eyes, and super stuffed up noses every morning. I couldn’t figure it out. Her diet was squeaky clean, and I had eliminated all sorts of common food allergens to no avail. I had never thought about environmental sensitivities until I started doing some digging around with my reading. The very week we threw a load of dust mite arsenal at her room, the darkness around her eyes went away and she slept sounder. We were still dealing with sneezy mornings (though admittedly less in intensity), and to be honest I knew what the problem was. She was sleeping on an old mattress. I knew it needed to be replaced, so we got to researching a solution. In the meantime, we covered her mattress with dust mite covers and followed a strict protocol to keep the dust mites under control. Our Dust Mite Control Plan! Cover the bed and pillow with dust mite covers. Wash bedding in hot water weekly and put pillows into the dryer on high heat for 30 minutes every week. Limited the stuffed animals in her bed to 5 or less and give those a tumble in the dryer on high heat along with the pillow every week. My research into safe bedding really opened my eyes to the chemicals and materials commonly used in making mattresses and bedding. I was even more convinced that her mattress had a lot to do with her environmental sensitivity symptoms. I couldn’t get over the polyurethane in the foams, the toxic flame retardants, the soy, and many other materials and chemicals used to make mattresses! I spent all this time avoiding chemicals in the food she ate, only to have her spending half of her day in a bed full of toxins! I researched so many sleep solutions and kept coming back to Naturepedic because the quality was so sound. We have been so happy with our Verse Organic Mattresses for the girls, and even more importantly, I am happy to report that my daughter has been sneeze and cough free every morning since we swapped out her mattress! The girls sleep 10-11 hours every night, and I know they are safe and comfortable. 100% Organic Cotton Fabric & Filling :: Organic cotton is the purest form of cotton and a healthier alternative to synthetic fabrics and foams. Naturepedic uses only U.S. grown and certified organic cotton as filling for its mattresses and buys directly from USDA certified sources. This increases purity, organic reliability and support for U.S. farmers. The surface fabric is soft to the touch and easily stretches to conform to your body. Safe Fire Protection :: Due to the innovative natural design and intelligent mattress construction, Naturpedic passes all Federal and State flammability standards without the use of fire retardant chemicals or flame retardant barriers. This is achieved through superior product design, the use of more natural materials and the elimination of polyurethane foam. PLA Comfort Layer :: The PLA comfort layer adds resiliency to the quilt for increased performance and moisture wicking. Our non-GMO PLA is a made from potatoes. It wicks away moisture, offers a comfortable resiliency, and does not off-gas harmful chemicals. In fact, it is used for food packaging and a number of biomedical applications. Breathable Encased Coil Support :: The coils in the Verse are individually wrapped for full body-contouring comfort. This method ensures isolation of movement while promoting balanced support for proper postural alignment. Exclusive construction completely avoids the use of glues or adhesives. Provides just the right amount of bounce while adding excellent breath-ability and heat dissipation characteristics as compared with memory foam and even all-latex mattresses. Safe Fire Protection :: Due to the innovative natural design and intelligent mattress construction, Naturepedic passes all Federal and State flammability standards without the use of fire retardant chemicals or flame retardant barriers. This is achieved through superior product design, the use of more natural materials and the elimination of polyurethane foam. 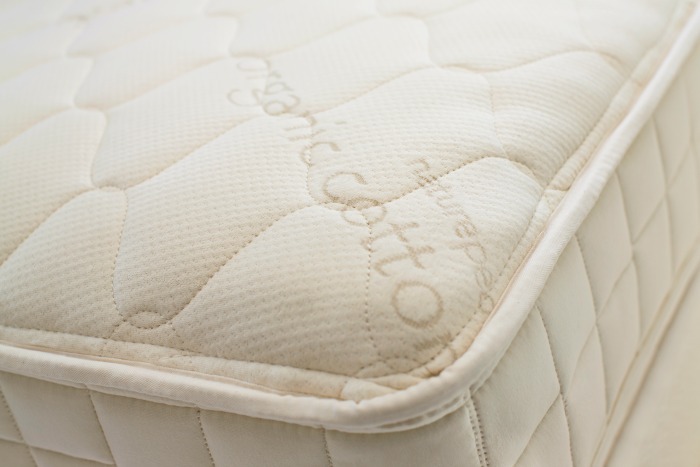 Organic & Greengaurd Gold Certified :: Not only are the individual materials certified, but the finished mattress is certified as well. This ensures that all components meet a healthy non-toxic standard. Certified by OTCO to the Global Organic Textile Standard (GOTS). All Naturepedic products are also tested for chemical emissions and certified according to stringent GREENGUARD® Gold certification standards. The day it dawned on me that what my kids were breathing in and sleeping on night after night affected their health, was the day my determination shifted to making that environment as safe as possible for not only their respiratory health, but their overall health. Sleep affects everything. Kids are unstoppable when they’ve had a good night of sleep, and every organ and system in their bodies function best when the body is well rested. Here is your healthy checklist to get started on *today* for a better night sleep! Naturepedic has an entire line of kid safe specific organic mattress toppers and pads as well as safe pillows and pillowcases that are a great start to breathing safer. 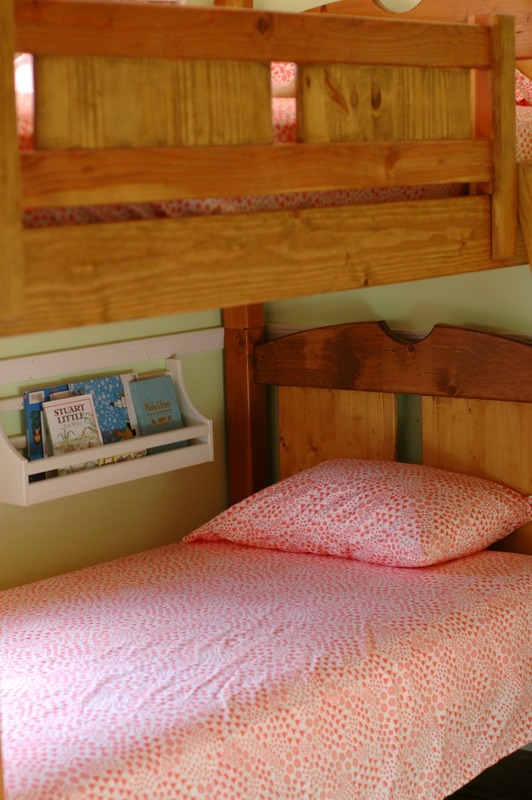 Remove clutter from the bedrooms to keep dust at a minimum. Follow the dust mite “protocol” for cleaning the bedrooms above. Get the kids involved to help with the load. If the kiddos are old enough to toddle around following you as you clean, they are old enough to carry a little dust cloth to help! Add a salt lamp to the bedroom to keep the air clean purified. The soft glow doubles as a night light for kids, and it doesn’t affect their sleep rhythms. I have noticed the salt lamp calms my kids. Ultimately the mattress does in fact make a difference. All of these things made a huge difference but it wasn’t until the mattress change that my oldest was finally breathing better the next morning! The Naturepedic mattress has been a great change for us! So talk to me! 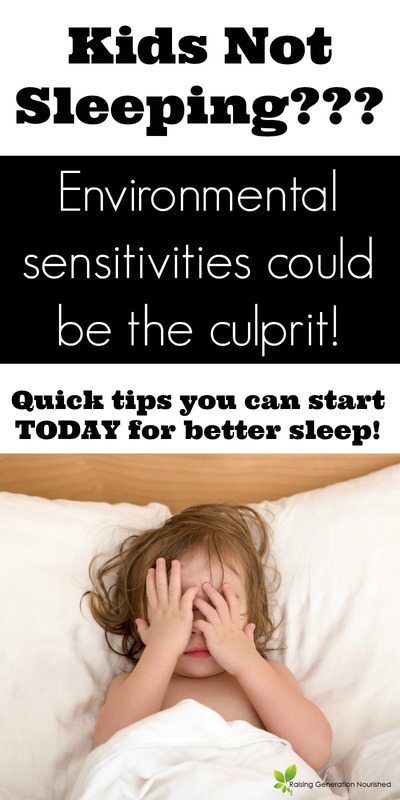 Have you experienced sleep struggles with the kids related to environmental toxins? What has worked for you? 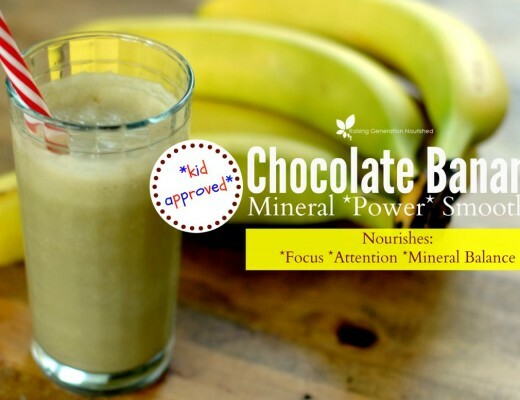 Chocolate Banana Power Smoothie Created To Promote Focus, Attention, & Mineral Balancing in Children! Love your dust mite tips! Especially drying the stuffed animals. I try to do that once a week too. I would love to get organic pillows and mattresses for my littles to help cut down on chemical exposure and dust mites too. Thank you Emily! It has really made a big difference! These are SUCH helpful tips I’d love to offer up in our sleep challenge, especially regarding purchasing an organic mattress. It’s hard to tell what the right investment is, and I’ve even been questioning a lot about my sleeping environment lately/how to improve it. Thanks for doing the hard work here! What a great article ! My brother has two young kids so I’m sure he’ll appreciate reading this article. I will forward it to him. Thank you. Yes! Just transitioned my toddler to a big boy bed, and I agree the right mattress and environment is key! I need to do the dust mite protocol! It’s so hard to make that decision to spend good money on a kid’s mattress since I think we tend to think everything of theirs is something they’ll grow out of in 5 minutes. But you are so right, they spend a huge portion of their lives on the mattress so we need to think about that. We are so glad that we did and can (no pun intended) sleep soundly knowing our kids aren’t breathing in toxins every night! That is so true – and the mattress is something they will have for multiple years – even into their teens if you have little ones! Really good idea with the stuffed animals that you don’t think about! I may have to begin the dust mite protocol myself to work on improving my own bedroom environment. I never thought of the stuffed animals before reading more about the dust mite issue! It really makes a difference! This is a great article, and I know a lot of my friends would love to have their little ones sleep through the night, so I’ll pass this one to them! 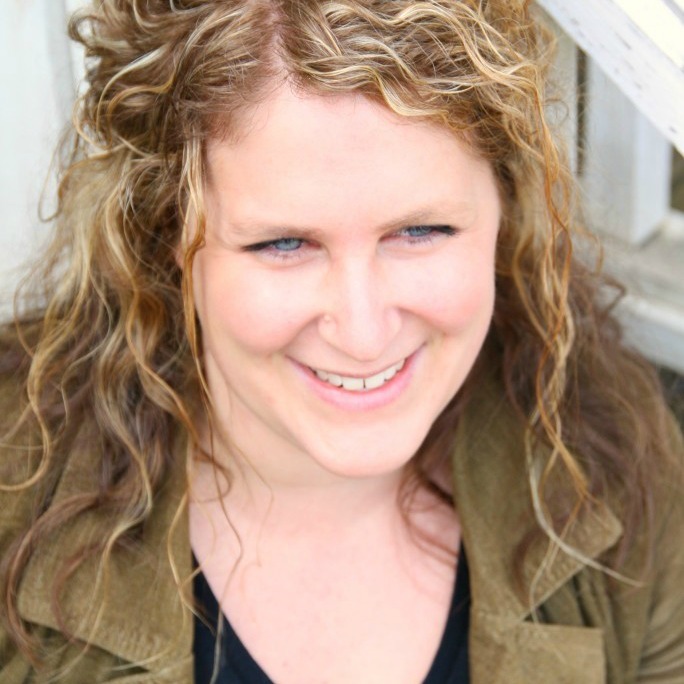 These are such great tips, Renee! I have 2 littles that are still in cribs, but I’m saving this for when they move to a bigger bed. I have mattress covers on their mattresses right now after reading about all the chemicals that they breathe in and how that can increase the chance of SIDS. I’ll be looking into the organic pillows you mention once they’re old enough. Thanks for all the great info! Super important and something that often goes over looked! Excellent read! Wow, good to know! Definitely keeping this in mind for when I have kiddos of my own. Next time we buy a mattress it will be one of these! I know we are all sleeping on a toxic waste dump…sigh. It is so hard! It’s one of those “know better do better” things! So glad you’re sharing this important information, Renee! It’s a sad but true fact that the world our kids live in is riddled with toxins, and concerned parents have their work cut for them protecting our little ones. Getting toxins out of your house is a big undertaking — glad you’re helping people get started! We’re just about to buy new mattresses for the kids. Thank you, Renee, for this review! Wow, thanks for all these great tips! I’m going to grab ALL the stuffies and give them a good drying today! I’m so hopeful to (one day) have all organic mattresses and pillows, but for now, with 4 kiddos and the grownups that’s a little costly! So thanks for the tips on keeping the mites at bay! Thanks for this, I would have never of thought of dust mites! This is crazy! Thanks so much for this article. 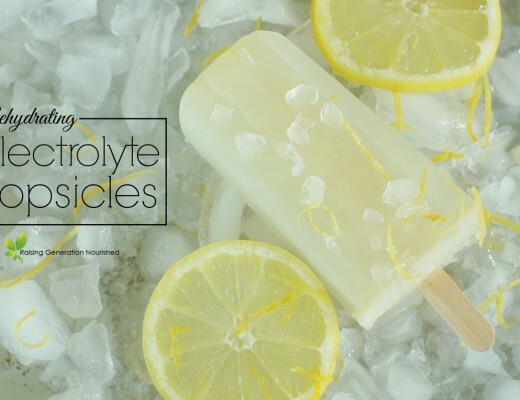 This is incredibly important not only for the kiddos, but for anyone dealing with health issues! Especially for those of us with an autoimmune disease, this is so important to know! Great info! Thank you for this! I am going to need to do some of this! This is a very informative blog post and highlights many issues that should be a concern to all parents. I, too, am deeply passionate about having healthy bedding in my home but it is a subject that warrants vigilance and being continually informed about our surroundings. Thank you for bringing this to light! You’re welcome Kelly! I agree! Thank you, I recently bought a Naturpedic twin mattress for my 4 year old, but he’s still having trouble sleeping. It had been awhile since I dusted, so I did a deep clean last night after reading this and he slept really good. Hoping it continues! Is your recommended salt lamp pretty dim? We just took his nightlight away but I’d like to have something dim in there as he’s not crazy about no nightlight. Thanks! Hi Bethany! Oh that’s great! It is amazing how much it helps! The salt lamp makes a great nightlight! I do put ours beside a bedside table so it isn’t super bright – but it has a dimmable switch so you can make it as dim or bright as you wish! Renee, thank you for your thorough research! I’ve spent countless hours on researching a mattress. My toddler is moving from her toddler bed into a twin mattress and after many searches, this is what we want for her. Financially, we can’t afford it for another month or 2. What could I do right now while we wait to purchase a mattress? She is using her mattress from her crib (currently on a toddler bed). And what made you decided to get the Verse mattress vs. the Quilted Deluxe? Hi Telma! That’s great! You will love it! I think in the meantime, I’d just cover her current mattress with a dust mite cover – you really can get them just about anywhere in bedding sections of stores, Amazon, or there is a link to one on Naturepedic here in this post. I don’t think you can go wrong between the Verse and Quilted Deluxe. The Verse just happened to be what Naturepedic sent me for the review so that is what we have. I think they both look excellent and we are now 4 mattresses into this company and so happy with their quality and service!